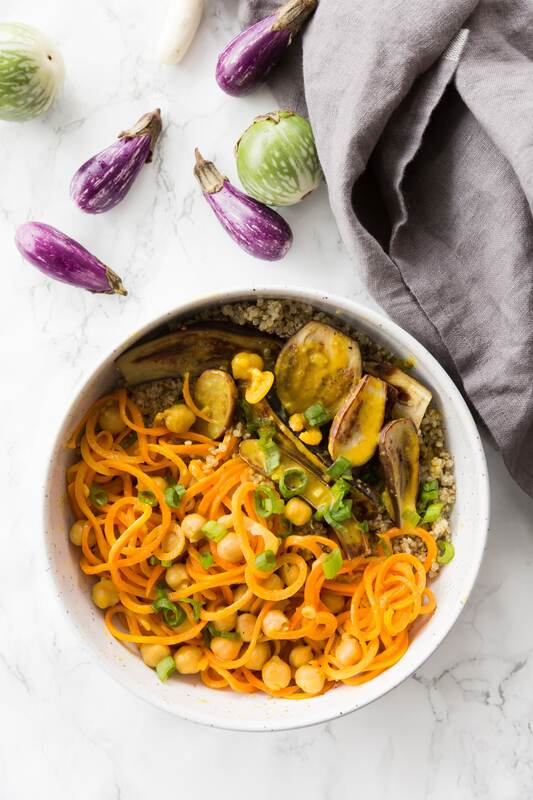 Chickpeas, spiralized carrots, and coconut milk make a creamy, dairy-free curry in these gluten-free quinoa bowls. The bowls are topped with seared mini eggplant for a nutrient dense, protein-packed, beautiful bowl of food. I order a lot of ingredients through an online grocery delivery service named FreshDirect. It’s local in this area (the tri-state) and it’s amazing – you basically grocery shop on their website and they deliver you fresh produce and pantry items. This isn’t a sponsored post, and yes, I have a point. Every week, when I do my big grocery order (and then go to Whole Foods to fill in the gaps/get specialty items that FreshDirect does not have), I always make a point to order at least one new food item that I don’t normally order. Thus, this curry was born – but simmering them in the curry sauce would make them soggy and lifeless, so what I do here is saute them, set them aside, and then simply top them in the bowl and drizzle over with the remaining curry sauce for that bang of flavor! 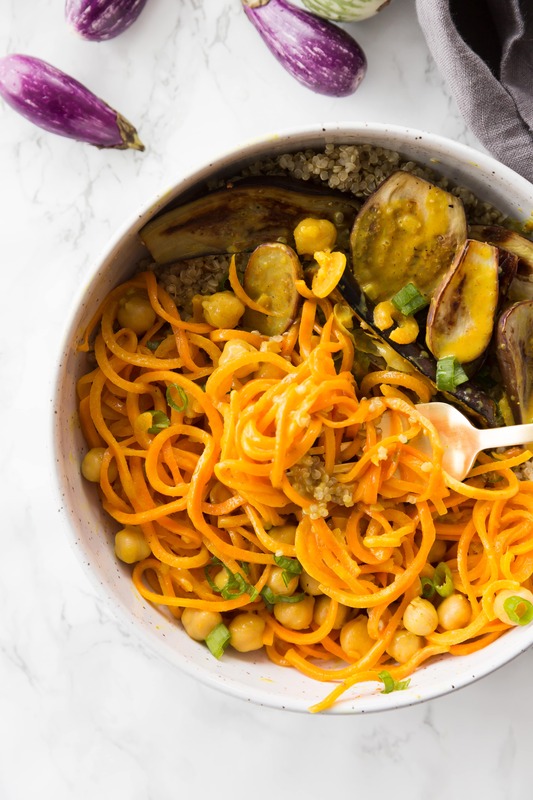 This whole meal takes 30 minutes – a quick curry with spiralized carrots, chickpeas for protein, all served over a bed of quinoa (or you can use brown rice) for extra protein and to catch all the yummy sauce. And, I’ll add that it’s meal prep friendly! Hope everyone has an amazing start to your week! Heat 1 tablespoon of the oil in a medium pot over medium-high heat. Once oil is shimmering, add the eggplant, cut sides down and season with salt and pepper. Cook for 2 minutes per side or until soft and fork tender. Set aside on a plate. Heat the remaining oil back in the skillet used to cook the eggplant over medium-high heat again. Add the white scallions, garlic and ginger and cook until fragrant, about 1 minute. Add the carrot noodles and toss. Add the curry powder and stir to coat the carrots. Pour in the coconut milk and chickpeas and stir well. Season with salt and pepper. Let simmer for 5-7 minutes or until carrot noodles are no longer crunchy. 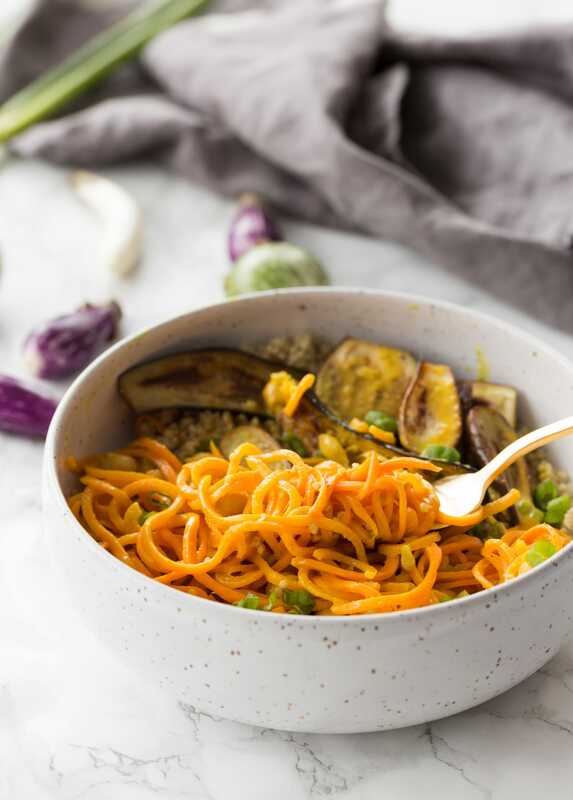 Divide the brown rice into bowls and top with the curried carrot mixture and eggplant. Pour over curry broth. Garnish with green scallions and serve. That is an amazing looking recipe and the pics makes it look so good. I will try it this coming weekend when the whole family is at home.